I am now hooked on making rosettes. They're fun and easy to make and the possibilities are endless. using soft pink and cream peonies. Then I attached it to this muslin tote bag I made for her. and a beautiful shabby scarf. Thanks Jill, I love them! Thank you also Jill for being a lovely and gracious hostess. You can visit Jill's blog to see more lovely rosettes. 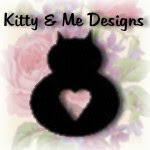 Today, I'm doing a guest post at Kitty and Me Designs. We're off to the cabin.....'see' you next week! Holy Moly! I love the bag you made and adore the scarf set you received. WOW, It's all just beautiful. HI Debi, love your work! Thank you so much for being my Guest Blogger today!! Have a wonderful & safe trip! both are beautiful! amazing to see all the different types of rosettes that people made! You'd think by now I wouldn't be amazed at the creativity and beautiful things given by swappers...but oh my! Thanks for sharing your beautiful creations and the tutorial too. ...lovely rosette item all around!! Yours, hers...so much fun to see alllllll the many concept of these oh-so-lovely fabric flowers! Oh my goodness! Just simply beautiful! I love seeing how everyone creates rosettes differently! Love the colors you chose for the rosette. All of them are gorgeous! you are always so inspiring to me...I love everything you make, everything you share, and everything you showcase! well done! What a beautiful blog you have! I found you thru your guest post at Kitty and Me Designs and have signed up to follow you. I look forward to exploring more of your blog, and invite you to join me at Create With Joy! Hey Sweet Pea! My goodness you have been busy!!! Lovely rosettes! Fill me in on things when you get back from the cabin...have fun! Oh, I love the rossette you made, its so pretty and it looks very good on your muslin bag too... Pretty, pretty!! The scarf is also very unique and shabby, love it!! That is a gorgeous rosette! The bag you made for her is beautiful. I adore these.Im going to make them this fall for sure.I wish I had a pattern.Thanks so much for sharing !